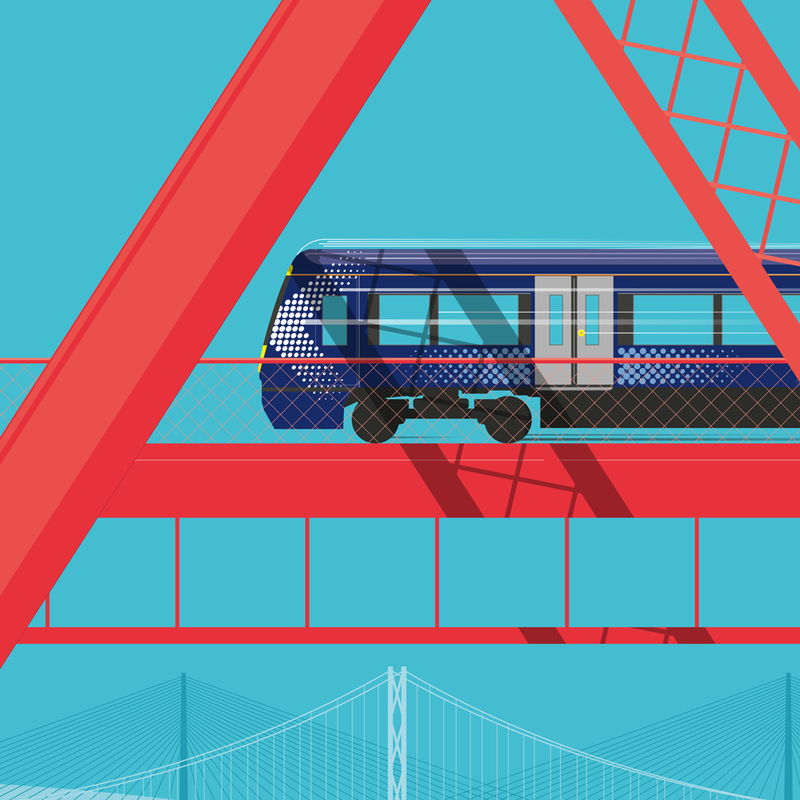 Getting to and from Fife by public transport is better than ever, with easier connections, improved choice and smart, flexible tickets. The Forth Road Bridge is now available exclusively for buses, motorbikes, taxis, cyclists, pedestrians and emergency vehicles. 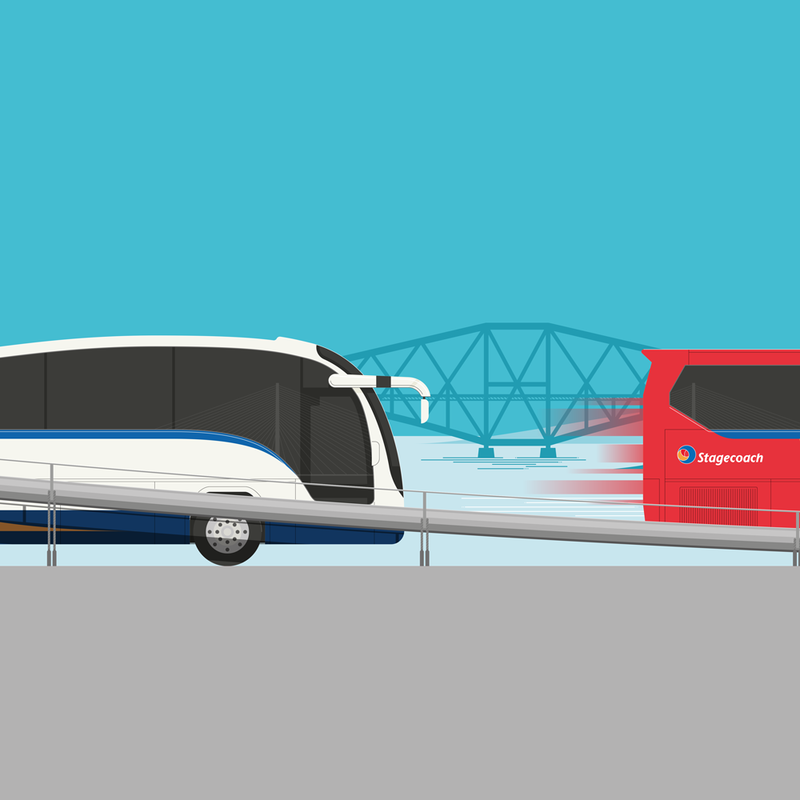 This means allocated bus lanes to help shorten journey times and reduce congestion. Major investments in the rail network being made across the country will mean more seats, faster journeys and better services - delivering the best railway Scotland’s ever had. Improved access and 1050 parking spaces at Ferrytoll P&R along with 1021 spaces at Halbeath, means quick, easy, regular connections, greater flexibility and safe waiting facilities. Smart travel is about providing modern, digital or electronic options for payment or tickets when travelling on public transport. We’re working to capture secure, best fit technology for your smart journey - connecting you with easier public transport services. 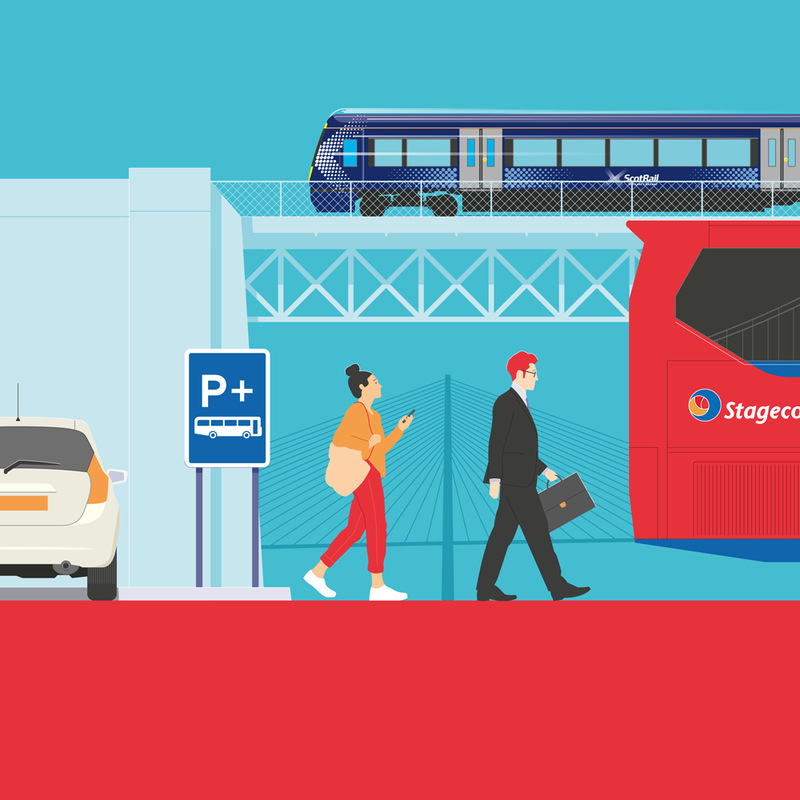 There are plenty of locations you can leave your car behind and jump on the bus or train, or connect between both modes for your journey. Not sure which mode of travel is best for you? 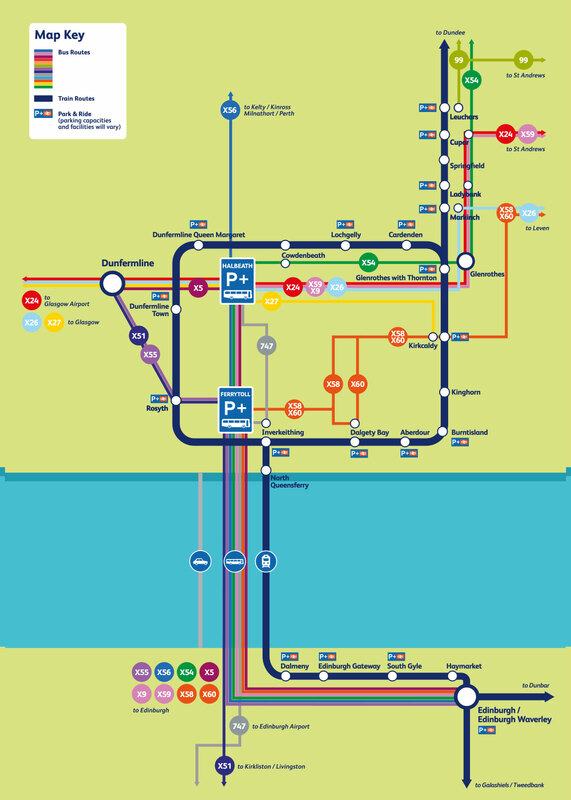 Use the Traveline Journey Planner. We’re still working on it, but you can try out smart travel today - sign up for a saltire smartcard, download your operator’s app or use your contactless bank card to see how smart can simplify travel for you. You can order your saltirecard online via your transport operators, myfife or Local Authority website, or pick up a StagecoachSmart saltirecard from the bus driver. Most tickets can be purchased online and then just tap and load onto your saltirecard at station gates, at ticket machines or validators for rail, and for bus just tap on board. This website is owned and operated by Transport Scotland, in association with Stagecoach Group Plc and Abellio ScotRail. Transport Scotland, Buchanan House, 58 Port Dundas Road, Glasgow, G4 0HF. An Agency of the Scottish Government, we are accountable to Parliament and the public through Scottish Ministers. Abellio Scotrail Ltd, 5th Floor, Culzean Building, 36 Renfield Street, Glasgow, G2 1LU. Abellio Scotrail Ltd is a company registered in Scotland with company number SC450732. Stagecoach Group Plc ("Stagecoach") Registered No. SC 100764. Registered office is at 10 Dunkeld Road, Perth, PH1 5TW Scotland. For the purposes of these Terms and Conditions "We", "Our" and "Us" refers to Transport Scotland in association with Stagecoach Group Plc and Abellio ScotRail Ltd. Please review these Terms and Conditions carefully before using this Website. Your use of this Website indicates your agreement to be bound by these Terms and Conditions. Permission to reproduce Crown Copyright material does not extend to any material on this site which is the copyright of a third party. Authorisation to reproduce such material must be obtained from the copyright holders concerned as stated above. We seek to ensure that the information published on this website is up to date and accurate. However, the information on the website does not constitute legal or professional advice and We cannot accept any liability for actions arising from its use. We cannot be held responsible for the contents of any pages referenced by an external link. We reserve the right to make changes or corrections, alter, suspend or discontinue any aspects of our website or the content or services available through it. at any time. Please note that any of the content on our website may be out of date at any given time, and we are under no obligation to update it. Unless explicitly stated otherwise, any new feature, content, products and services offered shall be subject to these terms and conditions. These Terms and Conditions contain all the terms of your agreement with Us relating to your use of this Website. We make no warranty whatsoever for the reliability, stability or any virus-free nature of any software being downloaded from this Website, nor for the availability of the download sites where applicable.